Sicily. Siculo-Punic. c. 320-315 BC. 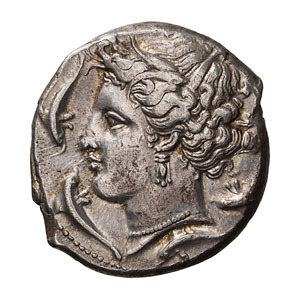 Tetradrachm, 16.87gg. (2h). Obv: Head of Arethusa left, of fine Greek style, wearing triple pendant earring and pearl necklace, hair wreathed with grain leaves, four dolphins around. Rx: Punic inscription ‘mmhnt, horse's head left, palm tree behind neck. Jenkins 152 (O47/R137). Lustrous and beautifully struck. 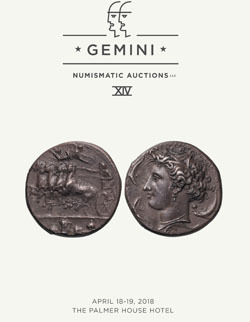 This Siculo-Punic issue rather exactly copies the Arethusa of Euainetos. 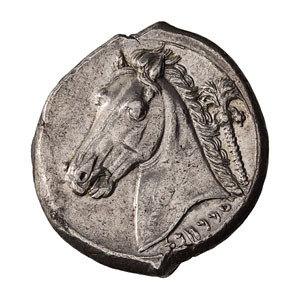 Utterly magnificent horse's head on reverse. EF/Mint State. Ex Philip T. Ashton Collection. Ex Berk 122, 6 September 2001, lot 159.